It is not until a person is stricken with blindness do they realise that there are many resources available for the blind. There are several charities and societies there to offer assistance. 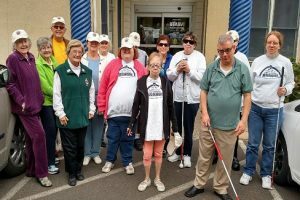 There are also many recreational clubs that offer a great service to the blind. Barnet Borough Sight Impaired: This is a group for the blind or those with low sight to come together once a month. Their mandate is to create a social setting where participants can socialise and share their concerns and experiences with each other. The group will often enjoy outings together. Geranium Club for the Blind: This is a social group that has been formed for those over the age of seventy. They enjoy different types of entertainment and social gatherings. A lot of blind people want to do more than socialising. They want to participate in outdoor activities where they can be active. London Blind Rambling Club: This is a club for the blind that is all about walking. Participants can get together to enjoy walks in various locations and of various lengths together. Hillingdon Blind Bowlers Club: Many that are blind are thrilled to discover that they can still enjoy their favourite activity of bowling. Participants in this club get to enjoy both short mat bowls along with lawn bowls. Social clubs and sports clubs are popular. There are several other clubs for the blind. Ones that focus on a specific activity.